Arsenal stars set for return Arsenal are on third spot in the Barclays Premier League with one point above Manchester United and six points above their next opponent Liverpool. Arsenal are on third spot in the Barclays Premier League with one point above Manchester United and six points above their next opponent Liverpool. Arsenal won their last season’s both Premier League and FA Cup home games against the Reds. Arsenal have won six back to back Premier League games and are hoping to make the figure seven against Liverpool on Saturday at Emirates Stadium. Arsenal fans have good news as three star midfielders Mesut Ozil, Alex Chamberlain and Jack Wilshere are likely to make a comeback against the Reds. 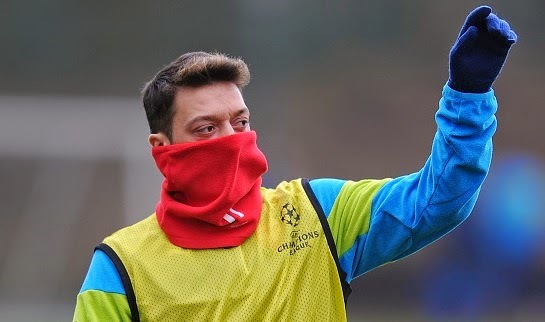 German star Ozil missed last game against Newcastle United due to illness but is now fit to face the sixth spot side. While Wilshere has been out since long. He is likely to return this weekend but Arsene Wenger will not rush him. The Englishman has been out since last November due to ankle injury he suffered against Manchester United in a Premier League game. Also, youngster Chamberlain is back but is expected to start from the bench. He picked up a hamstring injury earlier this month and was out for few weeks. On the other hand, Liverpool will be without several first team players including skipper Steven Gerrard who picked up a red card against Manchester United last weekend.